Concordia Station in Antarctica is one of the coldest — and most remote — places on Earth. With temperatures hovering at about -94°F (-70°C), snow covers every inch of the ground, and sometimes the sun can’t be seen for months. But it’s also a scientific base that a group of European scientists call home. Two of those people are Cyprien Verseux and Carmen Possnig, researchers from France. One day, they decided to „cook“ outside in the freezing temperatures to see how the food would react. Keep scrolling to see the mind-blowing photos of their culinary adventure, and to read Possnig’s first-hand account of life at Concordia. Cyprien Verseux and Carmen Possnig are researchers stationed in Concordia, Antarctica — one of the most remote scientific bases in the world. Verseux, station leader, is a glaciologist and biologist affiliated with the French Polar Institute, or IPEV/PNRA. Possnig is a medical researcher with the European Space Agency studying how the human body reacts to extreme environments, like Antarctica. They’re part of a team of 13 people that come from France, Italy, and Austria. About half of the group does research, while the rest keep the station running (doctors, cooks, etc.). One day, Verseux and Possnig decided to take their food outside and let the sub-zero weather work its magic. „I think it is hard to imagine for people what -70 to -80°C feels like, and we wanted to demonstrate what it’s like,“ Carmen Possnig told INSIDER. 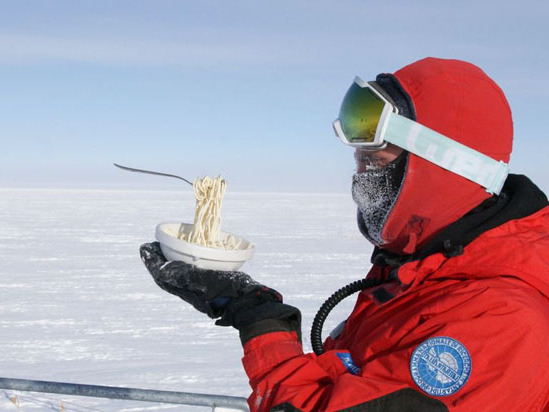 They chose spaghetti for their first dish, as it truly shows just how extreme conditions at Concordia Station are. „That’s just something that would never happen in Austria or France,“ Possnig said.